Italy is one of the top destinations for Times’ readers – no prizes for guessing why! With fabulous beaches and natural landscapes, great food and wine and enough cultural attractions to last a lifetime, a holiday in Italy does seem to tick an awful lot of our boxes. Which makes the compilation of a list of top 50 holidays to Italy quite a challenge! This year’s article included everything from hiking and gastronomic holidays to cycling, sailing and prosecco weekends. 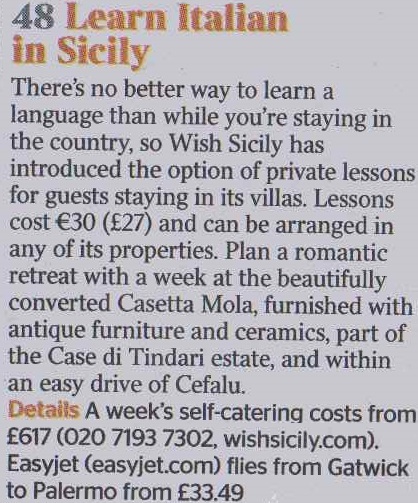 For anyone who fancies the idea of being able to chat with the locals, the Times picked up on our new option of taking private Italian lessons. These can be arranged for guests staying at any of our properties and are available on a one-off or daily basis – the important thing is that they are taken in the comfort of your rental villa and are completely tailored to your specific needs. At Casetta Mola, a beautifully furnished cottage for two on the Case di Tindari estate, guests can take morning or afternoon lessons and spend the rest of the day chilling by the pool or exploring the local beaches. Read more about our ‘Learn Italian’ programme here.